Two or more inventions may be the subject of a single patent application in the same application provided that these inventions are of a group of inventions recognized as fulfilling the requirements of unity of invention based on their technical relationship designated in Ordinance of the Ministry of Economy, Trade, and Industry. Unity of Invention is judged according to whether the two or more inventions possess identical or counterpart Special Technical Features (henceforth STF). STF refers to the demonstration of a technological contribution to the prior art of the invention in question. When unity requirements with the invention according to claim one are satisfied, a group of inventions is considered eligible for examination; conversely, when unity requirements with the invention according to claim one remain unsatisfied, a group of inventions is considered ineligible for examination, and an Office Action will be issued, identifying non-compliance with unity of invention. 3. Film manufacturing equipment according to claim 1 wherein C is cladded with heat resistant resin. 3. In addition to the invention according to claims 1 and 2, the invention according to part of claims 4 and 5, of the identical category and including all of the matters specifying the invention according to claim 2 (possessing STF), is eligible for examination. 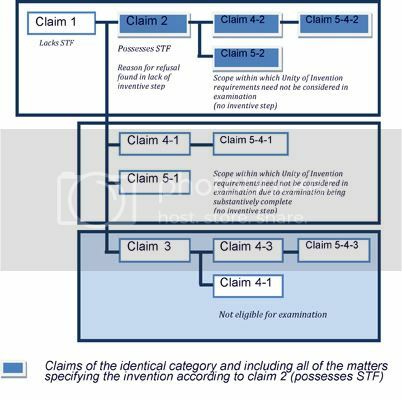 In other words, only those parts of the invention according to claims 4 and 5 which are dependent on claim 2 (claim 4-2, claim 5-2, claim 5-4-2) are eligible for examination. 4. Regarding the invention according to claim 3 and dependent claims, because claim 3 does not encompass the subject matter of the invention according to claim 2 (possessing STF), and the examination cannot be said to be substantively complete, these will be deemed ineligible for examination and an Office Action issued identifying non-compliance with unity of invention. 5. Concerning the invention according to claim 2 and claims 4 and 5, once the parts of invention dependent on claim 2 to are found to be lacking inventive step, those parts of the invention according to claims 4 and 5 which are dependent on claim 1 (claims 4-1, 5-4-1, 5-1) become eligible for examination because the examination on these claims can be said to be substantively complete. *Both the Chinese and Korean provisions and judgment criteria for unity of invention are the same as those of Japan as explained above. However Korean Patent Law emphasizes that an invention with unity, as a whole, must better the applicable prior art. Regarding amendments we would like to say that, amendments that make Claim 3 depend on Claim 2 (which has STF) are possible. Again, amendments creating dependency on claims that have already been substantively examined are also possible and eligible for examination (such as Claim 4-1-3). However, because Claim 3 is not eligible for examination, a divisional application will be required. Therefore, the points to be aware of in terms of unity of an invention are that previous research is vital, that claims should be defined serially, and that the dependent claims should be listed in the order that rights are desired.